Everyone knows the world famous Pasta all’Amatriciana. You’ve most likely eaten it at your favorite Italian restaurant or (if you were lucky) during a trip to Rome, the city that adopted it as its own. But you probably didn’t know that this pasta dish—one of Italy’s greatest—originated in the ancient, hillside town of Amatrice located in central Italy 140 kilometers from Rome. This week, Amatrice was hit with a powerful 6.2-magnitude earthquake that destroyed the town and devastated its people. It came only days before Amatrice was to host the 50th-annual Spaghetti all’Amatriciana Festival to proudly celebrate its eponymous pasta dish. Now the town is in ruins and victims are being pulled from the rubble. So, in honor of Amatrice and its people, I dedicate this post and recipe to the pasta that carries their name in hopes that you make it at home and send your thoughts, prayers…and love their way. If you’ve eaten Pasta all’Amatriciana in Rome, it was most likely made with bucatini, a type of fat spaghetti with a hole through the center. But the original recipe was born in Amatrice—not Rome—and strictly dictates that spaghetti—not bucatini—be used for this dish. 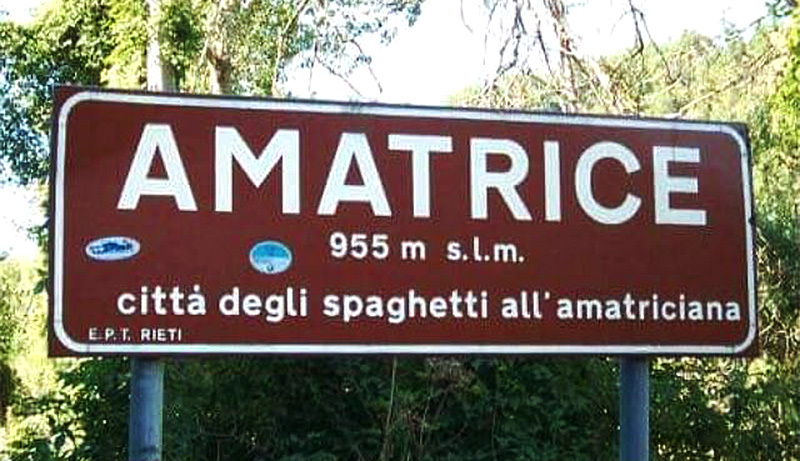 In fact, municipal signs at the city’s entrance proudly read “Amatrice: City of Spaghetti all’Amatriciana” to distinguish the original dish from the version that was later modified by Roman cuisine. Authentic Amatriciana from Amatrice is made with four fundamental ingredients: guanciale (cured pork cheek), peperoncino (red chili pepper), San Marzano tomatoes, and pecorino (sheep’s milk) cheese. Originally, the dish didn’t have tomatoes and was known as Pasta alla Gricia, a simple pasta invented by shepherds using the few staples they could take on mountainside herding trips. Tomatoes were later added to this ancestor dish once they became available after the discovery of America and Spaghetti all’Amatriciana was born. Romans later discovered this savory, satisfying dish and made it part of their culinary culture, adding garlic or onion and other ingredients that were not originally included. The protagonist of Amatriciana is guanciale, a cured pork cheek with sweet, flavorful characteristics that is a specialty of Amatrice. Its lard laced pork ribbons practically melt in the pan and give the sauce its distinctive taste. Often hard to find (even in other parts of Italy outside Lazio), guanciale can be substituted in a pinch with unsmoked bacon or pancetta…but the effect is not the same. Luckily, in the San Francisco Bay Area where I now live, guanciale can be found at a few places. I get good artisan guanciale from Belcampo Meat Company or Golden Gate Meat Company. 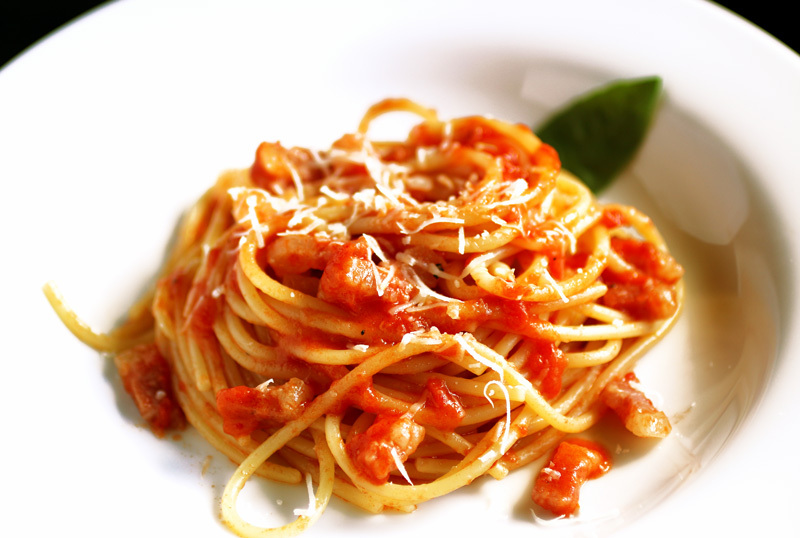 The other key ingredient that gives Amatriciana its unique umami taste is pecorino sheep’s milk cheese. A massive earthquake struck in the middle of the night while the people of central Italy slept. The hands of the clock tower in the town of Amatrice—one of the only buildings still standing—are frozen at the hour of 3:36 AM Italian time when the tremor occurred. Most of the town has been flattened by the earthquake and subsequent aftershocks causing more havoc. While Amatrice has been the hardest hit, other towns in the area that have been partially or completely destroyed are Pescara del Tronto, Arquata del Tronto and Accumoli. Rescue efforts have been ongoing for days but more help is needed for the people who have lost everything to this brutal force of nature. Why am I talking about earthquakes on a food blog? Because I wanted to put a “familiar face” on the name of a town you’ve been hearing a lot about on the news. Amatrice has proudly given the world so much pleasure at the dinner table that a little requited love is the least we can offer in return. A thought, prayer, or goodwill in the form of making or ordering their namesake dish can go a long way. Italians bring people together with food. This time, people are coming together and using food to help Italy in a moment of crisis. Restaurants around the world are donating proceeds of every plate of pasta Amatriciana served to aid the earthquake victims. And it doesn’t stop there. 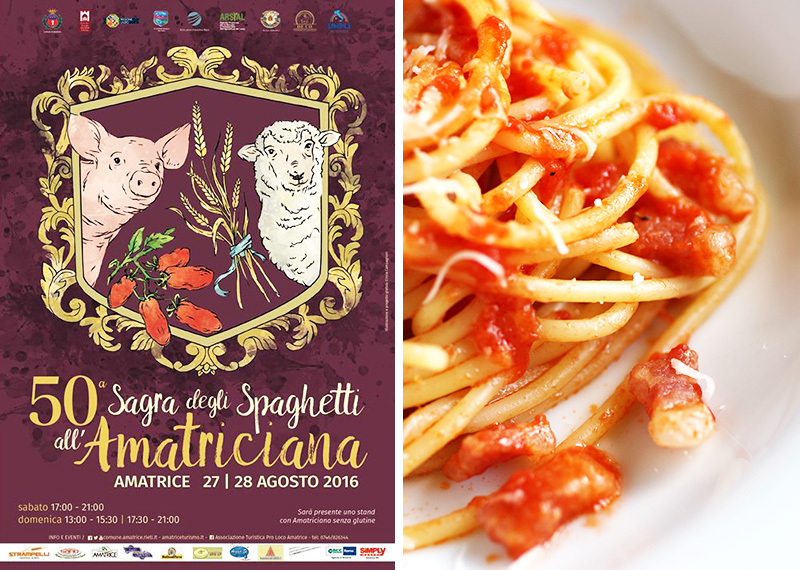 Since the spaghetti sagra in Amatrice could not take place this weekend, an online Spaghetti all’Amatriciana festival called #virtualsagra has gone viral around the web with people posting photos of their Amatriciana pasta and donating money to the cause. I hope you will make the recipe shared below and enjoy it in the name of Amatrice. P.S. : “Ama”, the first syllable of Amatrice, means ‘to love’ in Italian. San Francisco Bay Area: A16, Barbacco, Barzotto, La Ciccia, Delfina, Locanda, 54 Mint, ZeroZero, Montesacro Pinseria-Enoteca, Terun, iTalico, Tosca Cafe, ZeroZero, Riva Cucina Berkeley, Beach Chalet, Lake Chalet Oakland. **Those wishing to make a donation directly to the Croce Rosso Italiano (Italian Red Cross) can access their website here. Place 5 quarts of water in a tall pot, cover and bring to a boil. Add a generous handful of salt and keep water boiling until needed. Meanwhile, prepare the sauce. Cut the slices of guanciale into small, uniform pieces about 3/8-inch square. Heat the olive oil in a heavy skillet or sautepan large enough to eventually hold all the cooked pasta over medium-low heat. Add the guanciale and chili pepper and cook, stirring, until the fat turns translucent and the meat changes color without browning or crisping, 2 to 3 minutes. Add the wine and simmer for 1 to 2 minutes until the alcohol evaporates and the guanciale is soft and glazed. 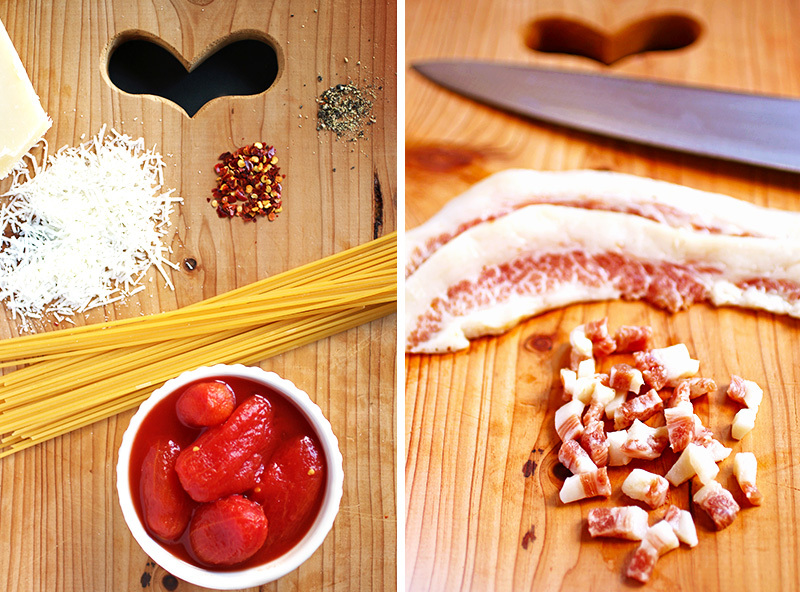 Using a slotted spoon, remove guanciale from pan, place in bowl and keep warm. Place the tomatoes to to skillet and season with 1-teaspoon salt and freshly ground pepper. Simmer over medium heat, stirring occasionally, until tomatoes cook down to a medium consistency sauce, 7 to 8 minutes. While the sauce simmers, cook the pasta. Add the spaghetti to the pot of vigorously boiling water and stir to prevent sticking. Cook the spaghetti until very "al dente", tender yet firm to the bite, about 2 minutes less than package directions. Add the guanciale pieces back into the simmering sauce and toss to coat. Lift the cooked spaghetti out of the water using tongs and place it directly in simmering sauce in skillet (reserving the pasta cooking water for later use). Increase heat under skillet to medium-high and toss spaghetti in the sauce until well coated, adding enough pasta cooking water to create a loose, juicy pasta, 1 to 2 minutes. Remove from heat and sprinkle 3/4 of the grated cheese over spaghetti. Toss well until the cheese is completely melted, adding more pasta cooking water if needed. Serve the spaghetti by lifting from pan with tongs and twirling into mounds on warm plates. Sprinkle remaining cheese over top. Ruth Ann, thanks for your lovely comment! Your positive thoughts and support are truly appreciated.